Marco's Organic Pizza is currently closed. You can still pre order for later by adding items to your meal. Go organic at Marco's Pizza in Perth! Pizza's made with organic ingredients are a much healthier, safer and more sustainable source of food for the future.Get your pizza delivered to your Perth home today. You'll love the crispier, tastier, healthier San Fransisco Sourdough base on our pizzas! The organic story Organic food is not some new health food fad.... in fact as Marco says "its just the opposite!". Organic food is the original food and has been around since life began...."before man started messing with it". Its real food the way real food should be - "straight from mother earth". Organic means its healthy, pure and wholesome, with nothing artificial added to it. And the good news is that healthy does not have mean boring and tasteless..... in fact as Marco says "its just the opposite!" Organic food is actually and naturally tastier .... sweeter, crisper, less fatty. So what makes organic different? Organic fruit, grains ;and vegetables are grown in soil that is fertilised naturally - with compost, mulch and what chickens produce when not laying eggs. Chemicals and pesticides are not allowed anywhere near organically grown produce. Organic meat has no artificial additives, (like the antibiotics which are currently having such an impact on westerners' immune systems) and comes from free range livestock fed on natural unadulterated fodder. At Marco's we take the healthy wholesome food concept very seriously because not only is it good for health, "its good for business!". 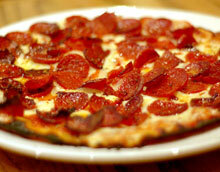 Its the reason we're the the winners of Perth's best pizza and why people have been coming back for more since 1976. The Marco's philosophy starts with the pizza bases. We use filtered water and organic flour. Mozzerella cheese is and always has been our "cheese of choice". The salsa and toppings are the best available, generously applied "so you really do get the flavor and toppings you asked for".